CSS has four different units that can be used to denote the size of fonts (and other elements such as margins). The application and relationships between these units can be very confusing, so this article will help you understand the main differences between the units, while our px to em calculator will help you switch between them in no time. If you ever wondered how to convert em to px, or pt to px, or couldn't grasp what the CSS em unit actually means - keep reading to find out! Pixels (px) are fixed-size units that correspond to the resolution of the screen - one pixel is the smallest "dot" that can be accurately displayed on the screen. Choosing this unit will result in a perfectly sharp and visible font on the screen, regardless what kind of display you will use. The only drawback is that fonts expressed in this units cannot scale (but it is possible to use the zoom feature of web browsers to enlarge the text). Ems (em) are scalable units, used in digital media. One em corresponds to the height of the current font; for example, if the font used has a height of 12 pt, then 1 em = 12 pt. Ems are a popular unit because they are easy to understand, can be scaled if desired, and are mobile-device friendly. The main drawback of ems is the threat of cascading - because this unit is relative, changing the height of the "parent" text immediately resizes all other fonts. Points (pt) are a unit for print CSS only. One point is equal to 1/72 inch, but only after printing. 1 pt will look differently across devices or web browsers, as it will depend on screen resolution. Points are not scalable and should be avoided in digital media. Percentage (%) is very similar to the em unit. The main difference is that 1 em = 100%. This unit is perfectly scalable, allows for zooming in and out. Similarly to ems, they can cause cascading. Set a base value. By default, this is 16 px. Determine the size of your font in any of the units. 1 em is equal to 100%. If 1 pt = 0.75 px, then 1 px = 1.33 pt. Hence, 24 pt is equivalent to 1.33 * 24 = 32 px. When finding the equivalent in ems, we need to divide the size in pixels by the base size: 32 px / 16 px = 2 em. As 1 em = 100%, 2 em = 200%. Make sure to check out our aspect ratio calculator and ppi calculator as well! 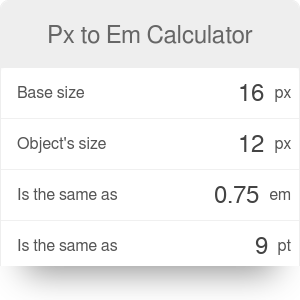 Px to Em Calculator can be embedded on your website to enrich the content you wrote and make it easier for your visitors to understand your message.